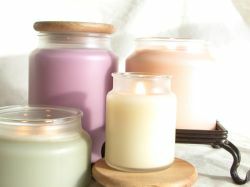 There is no question in my opinion that Pure Integrity Candles, are the best candles you can purchase today. They are clean burning, with very little or no soot and better yet no toxic emissions. Quite simply, “they are second to none”, including the paraffin and paraffin/soy candles that Yankee Candle produces. When it comes to throwing a pure and wonderful, strong scent through out your home, these candles are it. Their candles have much stronger and realistic scent than any Yankee Candle I have ever owned, including Yankee’s new “YC” product line. Their scents are so realistic you will swear they actually have the fruit, flower or dessert in the candle! Shopping at their store in the Eastern Hills Mall is also a pleasure. Its clean, bright and smells wonderful, their candles are packaged in very attractive frosted jars with beautiful hand crafted wood lids. Their store is also not cluttered with all kinds of other accessories, just the finest longest lasting candles money can buy. Simply the best candles made. My favorite candles are Orange Vanilla, Lemongrass Sage, Vanilla and Papaya Passion!! !